Note: as explained below in the message I posted on the documentary blog about the design research project I'm currently working on at ECAL, we've been pretty busy recently... and not only with the exhibition project mentioned even so we've been working on the scenography for it. So to say, this explains why we are having a hard time to be more active on | rblg! But hopefully, things will calm down a little bit after that and I'll find time again to write about the many projects we've been working on over the past two years, in parallel to continue archiving interesting works and resources on this blog! We had to work hard for the exhibition, especially because I was also in charge of the scenography (a work by fabric | ch in this case though), while Lucien Langton produced almost all the video documentation content. At the invitation of H3K curator, Sabine Himmelsbach, we’ll therefore present the work that has been realized so far, half-way through our research process. This will consist for large parts in video documentation and few artifacts, including some new ones (“Tools” oriented). We will use this material later on the I&IC website to fully document the current state of our work. The opening of the exhibition Poetics & Politics of Data will be tomorrow at 7pm, at H3K (Dreispitz neighborhood in Basel), the show will then last until end of August. Now in its 22nd year, the Saatchi & Saatchi New Directors’ Showcase hit Cannes again, unveiling another presentation of the new directorial talent. 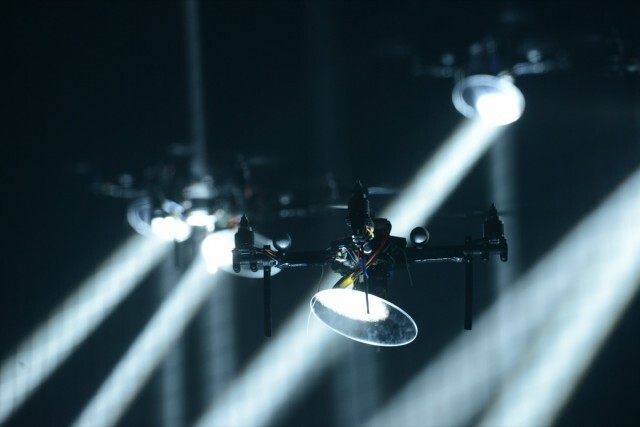 Marshmallow Laser Feast (Robin McNicholas, Memo Akten and Barnaby Steel) were the creative and technical directors of the production which included a theatrical performance by 16 flying robots reflecting light beams on the stage. CAN got the all the details on how this mesmerising performance came into being. Although that it's branded (Saatchi) and in a typical "communication style" (the infamous "wow" effect of some marketing staff), the performance remains technically impressive. Especially the work of the robotic guys (KMel Robotics). A good address for future works! We have a project with flying robots in the drawer for some times now (in fact since 2006... when we wanted to do something with blimps in the frame of a forthcoming research project).